Because of cooking, sterilizing, threshing and mashing made the pulp soft and damage pulp cell structure, the palm pulp becomes soft and cell is broken. Then it is sent to continuous screw press. 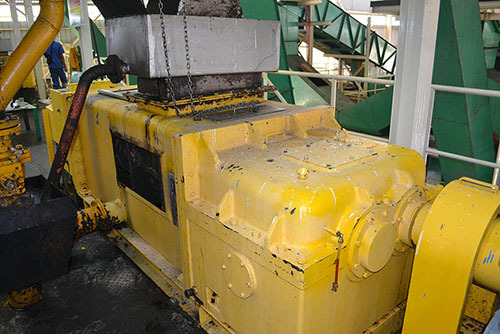 After pressing, oil palm fruit is divided into two parts: the mixture of oil, water and solid impurities, and the press cake (fiber and nut).The pulp stone separation obtained CPO and stone, press machine adopts the double screw helix continuous discharge and hydraulic, greatly improving production efficiency. Palm fruits through elevator and conveyors, enters into upper steaming boiler of oil press machine. Stirring and heating with steam to destroy the emulsified state forming from oil and water, wherein the coagulation protein denaturation and to reduce the viscosity of the oil for further convenience of palm oil pressing process. Digesting temperature keeps at 95-100℃ about 20 minutes. Palm fruit after digesting enters into screw oil expeller for palm oil pressing.